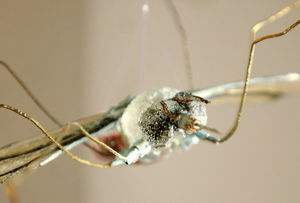 A mosquito made of glass, copper and needles titled "Just little skeeters...?" is part of Stephanie Cochran's "From the Smallest Among Us" exhibit by on display at Park Pace Arts on East 8th Street. ANDERSON — As a child, Stephanie Cochran used to go outside and gather insects in Ball jars. She even used to keep praying mantises throughout the winter. That childhood fascination continued into adulthood, and now the artist creates pieces focused on her love for the little critters, but also how they relate to contemporary events and political issues. A collection of her work is on display at Park Place Arts’ newest exhibit, “From the Smallest Among Us…” The show opened Aug. 1 and runs until Sept. 13. Walking up to the entrance to the art gallery at 515 East Eighth St., guests are greeted by a giant mosquito statue. It’s just a taste of the many large pieces inside. Eliot Reed, Park Place Arts owner, said it’s the first all 3-D show he’s had. “What interested me about her work was her narrative on environmental issues, natural phenomenon (and) you know, small aspects of life that are looked over but she seems to find the detail, (and) the intricacies of the small aspects of life,” he said. On one wall in the gallery, 10 nests of various sizes made from hot sculpted glass called “Hornets Nest or Cathedral Pipes?” A giant hornets nest made out of paper, plastic, steel and light bulbs also hangs in the middle of the room. Cochran said she didn’t necessarily set out to draw parallels between the human world and the bug world. She just still found the critters captivating. Over time, she started seeing how bugs and human issues are connected. Blown and fused glass and copper mosquitoes with needles as their mouths hang in part of the gallery. Cochran said the pieces are about issues surrounding wetlands in Indiana and how man has impacted major ecological changes throughout the state. Mosquitoes have a place in nature, but they also transfer diseases like malaria, causing human deaths. It’s supposed to cause people to consider the impact of changes humans make in the community. “I’m not trying to give the answer, I’m just posing the question,” Cochran said. Cochran will give answers about what she was trying to portray in each piece, though. Park Place Arts is hosting a gallery talk with the artist Sept. 3 so art enthusiasts can ask her questions about her work. Not every piece is politically charged, though. In one corner, a giant glass spider hangs from a piece of string, as if it was hanging upside down from its web. The spider is sort of a self-portrait, Cochran said. It represents how she questions her place in her community. Is she helpful or creative? Spiders aren’t necessarily bad like people think they are, and using it as a self-portrait is a way to reflect on one’s own motives. The exhibit is open noon to 6 p.m. Tuesday through Friday until Sept. 13. Cochran will also discuss and answer questions about her artwork at 7 p.m. Sept. 3 at the gallery.